“In a bull market and particularly in booms the public at first makes money which it later loses simply by overstaying the bull market…The big money in booms is always made first by the public-on paper. And it remains on paper.” – Edwin Lefèvre, Reminiscences of a Stock Operator. 1923. Promoters of the boom (Wall Street Firms) cannot be relied upon for independent investment advice. They profit by selling investments that are in demand. When demand is high for any investment, so is price and therefore these are not wise investments. 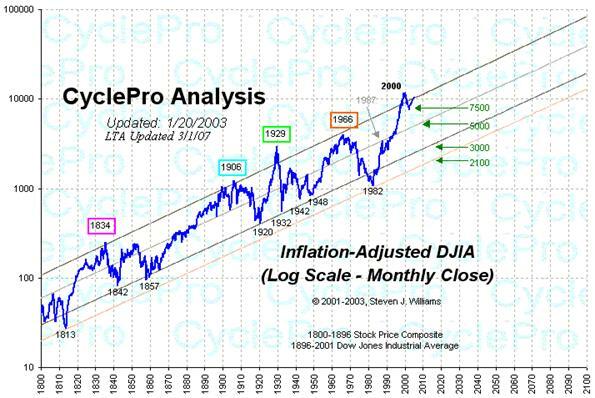 The chart above from Steven Williams at CyclePro.com shows the Dow Jones Industrial Average adjusted for inflation since 1800. As you can see, when the effects of inflation have been extracted, the DJIA is much more cyclical than Wall Street promoters would care to admit. In optimistic peaks of 1834, 1906, 1929, and 1966 the DJIA subsequently moved to the bottom of the long term trend channel. These bear markets were either inflationary, such as the 1966-1982 bear market or deflationary such as in 1929-1932. We have also noticed that inflationary/deflationary crashes tend to alternate. We suppose this is because Mr. Market likes to fool even the bears. Today we are again at the top of the trend channel. How will we fall? Most bears remember and fear the stagflation of the 1970s. However with debt levels currently high, inflation cannot be maintained for an extended length of time. Debtors would merely file for bankruptcy or foreclosure (as they have begun recently). Instead a deflationary spiral similar to 1929-1933 or 1834-1842 is likely. It appears the rule of alternation will continue. This chart also shows possible future levels for the Dow Jones Industrial Average. According to the trend lines followed since 1800, the DJIA could reasonably fall to 3000 by 2012. This is our target. Astute chart watchers have recognized that markets follow elliptical curves. 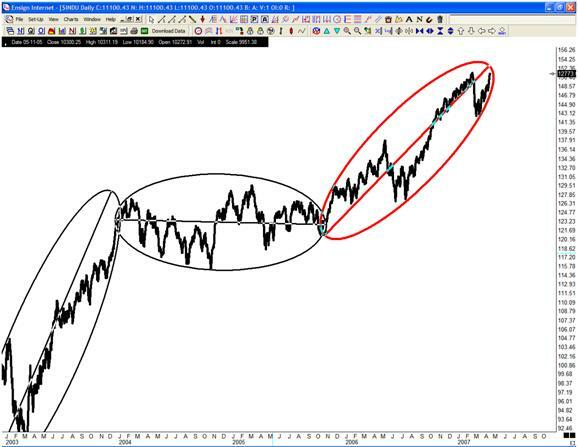 Currently, we are finishing up an ellipse that started in October of 2005. Notice the chart of the DJIA below, price is riding up the side of the ellipse. This is similar to price action in late 2003. (Another example of the elliptical curve is the 5yr chart of the Shanghai Index.) When price snaps out of this ellipse, the DJIA will be pursuing a new direction: down or sideways. Of course, readers know our bias is down. We believe the decline will be swifter than February’s sell off. Bank failures in the Great Depression were caused by savings lost in the stock market bubble. Today our banks are prevented from investing in the stock market, instead restricted to a “safer” asset class: real estate. To see the illiquid bubble that some of our financial institutions are now dependent on, see the chart below of U.S. home prices adjusted for inflation back to 1890. Speculativebubble.com has created a rollercoaster video of this chart, which we recommend because it reflects the emotional aspect of markets. Financial institutions that are based on the real estate market will face serious problems as the boom unwinds. Mortgage lenders are already going bust. As home prices continue to fall, aided by regulatory and market restrictions on credit, baby boomers will put investment properties, in which they hold little equity, on the auction block. Alt-A mortgages which fueled these properties will fall in value. Current ‘thinking’ is that financial institutions have passed on much of the mortgage risk to hedge funds. However when hedge funds fail, ‘prime brokers’ historically have been forced to accept the hedge fund’s losing positions. Illiquid arrangements (for instance credit derivatives) will then be the responsibility of the prime brokers. They will be forced to sell at any price as they try to prevent losses on their own books. As the editor of The Commercial and Financial Chronicle in November of 1929 reported on the Great Crash, ‘the crowd didn’t sell, they got sold out.’ The trading desks of the Wall Street Firms will cash out as the panic develops, the lady in Omaha will be stuck on the phone with a busy signal. At Lamont Trading Advisors, we are liquidating historically overvalued assets and purchasing liquid U.S. Treasury Bills for our client’s IRAs and brokerage accounts. The LTA Treasury Bill Account protects principal until market conditions warrant bargain hunting. For more details about this arrangement, visit our website or contact us.